It's still early as Windows 8 is releasing today, however, I can imagine that apps can be quite disruptive in the Enterprise. In larger companies, you typically work with windows computers that are locked in any way possible and you get to work with the applications that fall within the policy of your role. However, not all companies go about this in a similar manner and employees have much more freedom to operate their PC's. 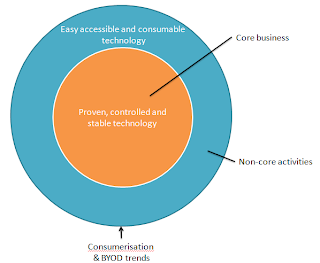 In a BYOD world, employees have even a lot more control over their own working equipment. Last year I wrote an article about the face of a new target architecture where I stated that Enterprise should provide stable and proven IT solutions for their core business activities. And in their non-core activities or supporting services they should loosen up and allow for more creativity of business users by allowing them to use technology, things they might know from home usage. The role of IT is to facilitate business users in the use of these consumer tools and to provide transitions to more professional solutions once they are used more and more for core activities. Companies like Yammer spotted these trends and jumped on this phenomenon by creating a Facebook like platform for use within company boundaries. I believe that the Apps trend on the Windows platform and Apple Mac will provide even an easier access to technology for the business users. They'll get more productive and even find ways to make these technologies part of the companies value proposition. So, companies need to give their business users the technological leeway and IT's role is to facilitate or be broker between the business and the outside.